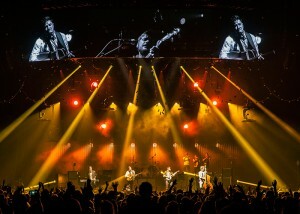 Grammy and Brit Award-winning UK folk rock phenomena, Mumford & Sons, continue their action-packed touring schedule, having just finished a string of Canadian and US shows where Robe LEDWash moving lights were once again a prominent feature on the lighting rig designed by New York based LD Ed Warren of Next Level Lights. 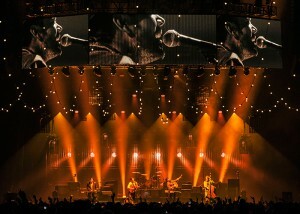 For at least the past 12 months, Warren’s lighting rig for the band has contained continual evolutions based on different variants of tungsten lighting. He is a big fan of its softness, subtleties and specific qualities. 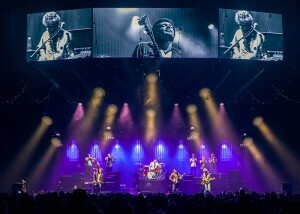 For this latest Canadian/US section he incorporated 16 Robe ROBIN 600 LEDWashes and 14 Robe ROBIN 1200 LEDWashes into the design, which were supplied by lighting and sound contractors, Solotech. 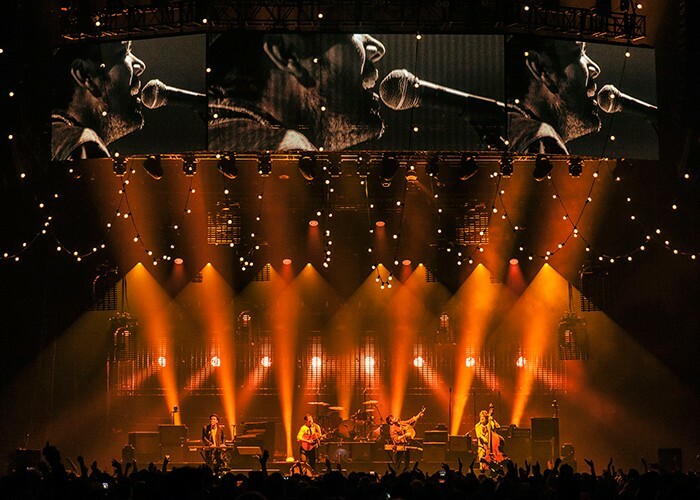 Robe’s LEDWash fixtures have also had a constant presence on the Mumford & Sons’ lighting spec since the start of the ‘Babel’ album tour cycle 12 months ago. They are fixtures that Warren “Loves like a long lost brother”. Among many other features, he fully appreciates the fact that the LEDWash series produces an excellent tungsten emulation, and he also finds the individual ring control very useful for introducing an intricate and different style of movement to the performance. Sixteen of the LEDWashes were up on the trusses over stage on LX bars 2, 3 and 4, with some on drop-bars behind Chromalech Elidy LED matrix panels hung on the same truss. The other 14 LEDWashes were arranged in two rows of seven behind their upstage Elidy wall, the lowest seven fixtures were a metre off the ground and the higher ones were at two-and-a-half metres. The Robe fixtures blasted through the semi-transparent Elidy with great effect, producing provocative silhouettes and dynamic breakups as the light passed through the LED panels. 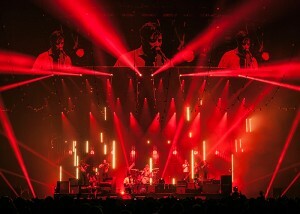 Warren used the ring effects of the LEDWashes in various configurations throughout the set to create a series of different and unique looks. Placement of the LEDWash 1200s behind the LED wall to illuminate the far upstage wall was a big success, particularly the way that adding lighting and colour behind the LED surface added another dimension and more depth. He also created his very own lightbulb effect using the innermost LED chipset of the LEDWashes in 3200°K tungsten. “Most people actually believe they are some sort of genuine tungsten source, like a light bulb minus the filament,” he revealed. Aside from the rings, he also made the most of the LEDWashes’ wide zoom. “We are having a great time on the tour using the Robes,” he declares. 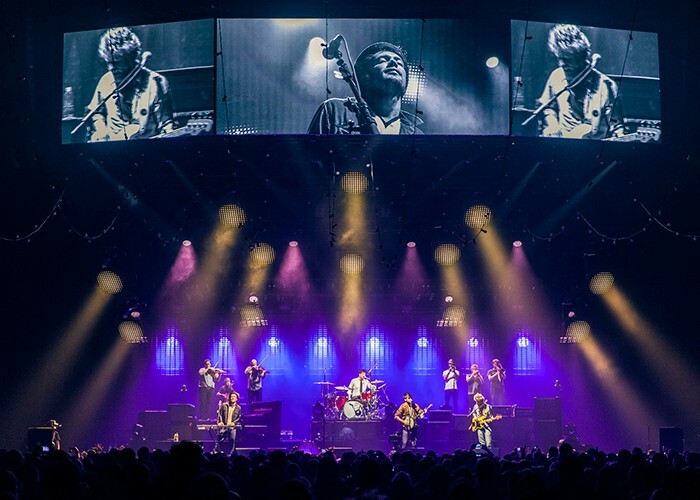 Warren operates the lightshow which includes other moving lights, conventionals, festoons and strobes using a Chamsys MagicQ 100 console with two wings. He is working closely with his right-hand man, Moonunit, as the tour continues through the summer playing UK and European festivals – with the same rig – followed by another US jaunt in the late summer.